For me, music sets a mood. It just so happens that I sat down to listen to the album Didi Pop Goes to Hawaii on an unseasonably cold Melbourne afternoon. It brightened my day instantly. 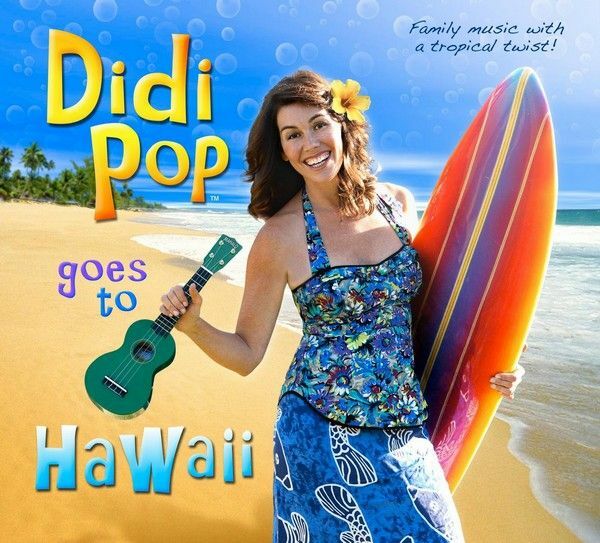 Billed as ‘family music with a tropical twist’, Didi Pop Goes to Hawaii is an album brimming with happy Hawaiian-style tunes. The songs are ordered to chronologically reflect a family’s holiday to Hawaii, so the album begins with Wowie Gazowie (Goin’ to Maui) and finishes with Going Home. In between there’s warm sand, eating juicy mangoes, bouncing on the hotel bed and swimming at Kapalua Bay. It is not until you listen that you note all the sounds that make traditional Hawaiian music unique. Obviously there is the ukulele (and there are an impressive four ukulele players on this album!) but also listen out for slack-key guitar which gives Hawaiian music its distinctive sliding ‘wahine’ and Didi Pop’s deft vocals that reflect traditional Hawaiian chants, falsettos and rhythms. The opening track, Wowie Gozowie (Goin’ to Maui), is incredibly catchy but my favourite is the Hawaiian Alphabet Song – get the kids sorted for their next tropical holiday by practising their “Humu humu nuku nuku apu aa” – Didi makes it sound so easy! It’s not Hawaiian without a hula and Didi Pop’s contribution, The Keiki Hula is perfect for an impromptu lounge room luau – pull out the grass skirts, put a hibiscus behind your ear and you’re set! Didi Pop Goes to Hawaii is $16.99 and is available through iTunes.